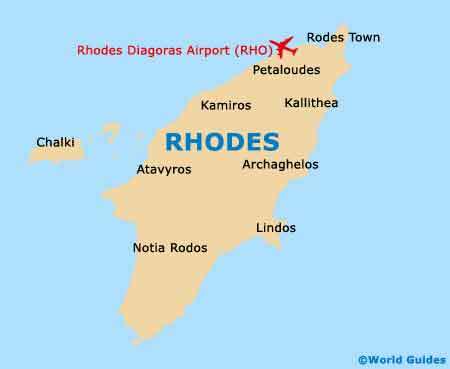 As such a major holiday resort, it will come as no great surprise to hear that the island of Rhodes contains a far more than adequate selection of restaurants and eateries for tourists to choose from, offering international dishes from all around the world. If you are looking for traditional Greek dining on Rhodes, that there are plenty of tavernas and similar restaurants waiting to serve you. On restaurant menus, you can expect to find a very typical style of Mediterranean cuisine, with the most common element of Greek dishes being olive oil, which appears in some form in virtually every meal served. Greek dining venues on Rhodes also like to use a lot of strong flavours in their food, such as garlic, onions, basil, thyme and oregano, to name but a few. As the island's capital, the best selection of dining options are to be found within Rhode Town itself. 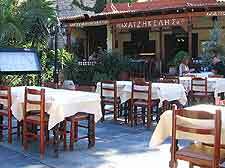 Restaurants in the Old Town area tend to be a little more reserved and locals living on Rhodes generally don't approve of the modern disco bars and lively cafes that have appeared here in recent years. Many of these eateries surround the main public squares, such as the Plateia Damagitou, the Plateia Dorieos, and the Plateia Rimini. The New Town area of Rhodes Town tends to be much lively, with loud music often to be heard blaring out of doorways to restaurants and bars. If you are planning to eat out in this part of town, then you will find that the main dining venues are concentrated around the Orfanidou and the Alexandrou Diakou areas. 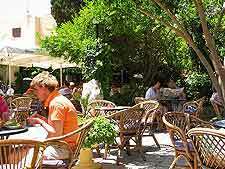 Wherever you are staying on Rhodes, you can be sure to good restaurants are never too far from hand. Even when you are on the beach, many Greek tavernas are often very close by, being particularly noticeable at Kiotari Beach. 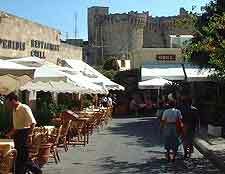 Fine dining is also readily available at the island's resort of Lindos, with eateries often being houses within historical buildings, in the lower village area.